Totally, 100%, spot on. 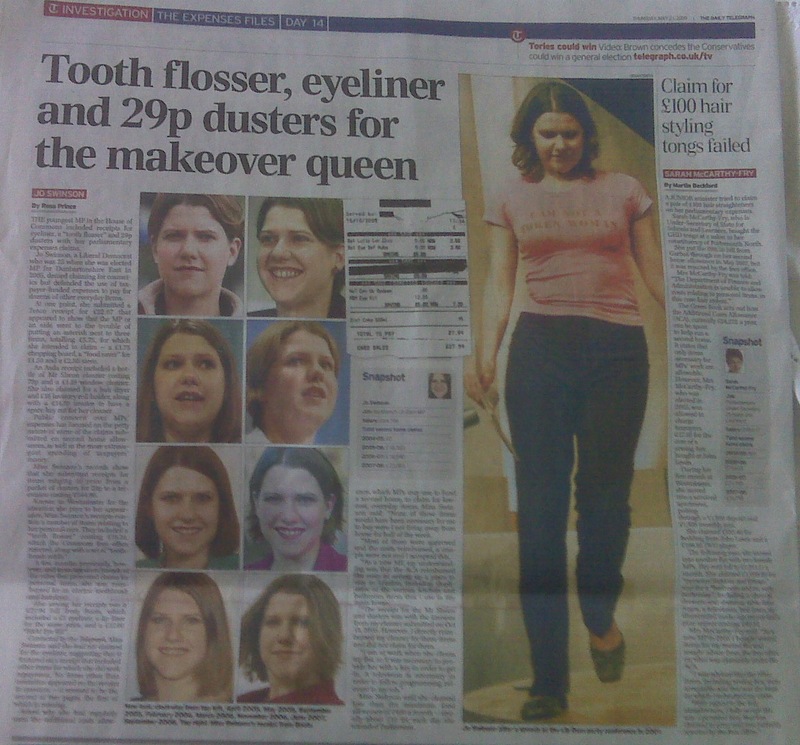 I was furious enough about the treatment of Jo and I hadn’t realised how thoroughly nasty the print edition had been. Am I allowed to say that I think they are vile mysoginistic bastards who ought to be ashamed of themselves or is that going too far? Excellent analysis James and I agree that your relative distance from this story has likely helped you to look at it from this perspective. The media are now just going for everything and everyone. No defence seems to be legitimate in their eyes and this will hugely damage our political system if it doesn’t start to abate soon. Jeez – I thought the web edition was bad! Also the “makeover” seems to consist of at most two minor hairstyle changes over about about a 10-11 year period. This is the latest chapter in how women politicians are treated with regard to their appearance. I first really noticed it running Jackie Ballards leadership campaign. Both Jackie and Charles had lost weight in the run up to that campaign (both before Paddy’s resignation). Virtually every profile piece on Jackie mentioned it, nearly none of the ones on Charles did. In my view, yes – see my next post. This is in the same category as Woolas and his nappies. Ridiculous. 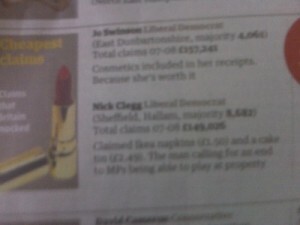 But I’m not thinking all the Lib Dem scrapes are eventually going to involve such trivia. Take Norman Baker and his office at home. There’s an example and a pointer. Paul Rowen MP has a somethingly contrived tenancy with a Lib Dem Party who in turn rent from a Lib Dem owned and run Limited Company. In the first year of that the Lib Dem unit published accounts – they’ve now stopped doing so – that appeared to show that (a) the rent to the party from the LD run limited company had trebled (b) they hadn’t been paying it before, just support in kind (c) they charged Rowen twice this new annual rent for a 2/3 year period and for only part of the space and (d) the Lib Dem run company then gifted most of the party rent back in a declared donation. Â£5,000+ apparently into party funds – all orignating from tax and council tax payers – in 8 months for premises that had previously been free and gratis. Since that time there have been no published accounts and no declared donations. Rowen has taken adverts at a ridiculous cost in 10s of 1000s of Focus newsletters. Â£700 for each edition for an advert which merely states his surgery details. As if they wouldn’t include those anyway!! Rowen has also used tax money to pay for a hoarding at a football ground which some believe he previously said he was financing from his own personal money. Rowen claimed his council allowances for three years as a two jobber. There are vague noises about giving the money to good causes. But Rochdale folk and nearby bloggers would like to know what these are/were. Rowen also employs political operators and the word on the streets is that their prodigious output (hats off, respect is due) are more along party political lines – including some very nasty smears and some press interference – than bona fide parliamentary assistance. Some of those accounts, back in the day when they used to publish them, also stated in black and white that political workers, previously funded by the party, would now be paid from the taxpayer funded allowances. And Rowen has also used tax payers money to buy web services from a local publisher … who for the most part have been bigging him up and refusing to cover his opponent, even cropping the man from a photo and excising him from a story about a meeting he, the Lib Dem PPC, had organised. That sort of thing has increased since that PCA payment arrangement started. His second home costs are also very high sided indeed. Rowen’s ACA has been more than twice my friend John Leech’s claim. In fact it could be close to treble it next time. Meanwhile Leech too rents from Lib Dem supporters, also shares with his Lib Dem party, also takes tthe odd surgery advert in focus newsletters and Manchester News, also employs a number of activists whose work-politics balance is hard to discern, and he additionally has a bit of a printing business – WPS, an unincorporated and unaccountable hobby club! – operating from the office address. That “club” has smudgily printed some of his PCA output on their hobby kit i.e. Risos. And also been credited on all sorts of glossy items that they could not have printed themselves. They contribute rent, equipment hire and profits to the cause. Leech says he shares his office with the party to “save money”. The only question there is who is doing the saving. How is the split calculated and by whom? I’ve seen more of Rowen’s information. On the face of it he looks to be in a far far more serious place with party political activity on the taxpayers than others. But we’ll see when we have more disclosures and have the chance to ask more questions. Of course we’ve had Chris Davies MEP doing the advertising on leaflets thing. And Chris Huhne MEP famously did it to aid Chris Huhne PPC back in the day. So, is this perhaps a fourth category? Taking money off the tax payer and channelling it to party political activity and funds? By hook or by crook? Is that going to be the main Lib Dem disease? And if so is that better or worse than gaming the system for scatter cushions or even a spot of moat scrapings? It may be hard to grasp but I think it’s worse myself. I am so cross, I just dont know what to say. Jo does not deserve this sort of treatment most unfair. I think to make those discusting remarks about her looks and the fact she takes a pride in her dress, if they said that about other MPs there would be an outrage. If this is all they can do to hit the Lib Dems, they need to grow up or give up. All I hear on the street is the MP Expenses nothing else is talked or joked about as much what happened to the credit crunch.